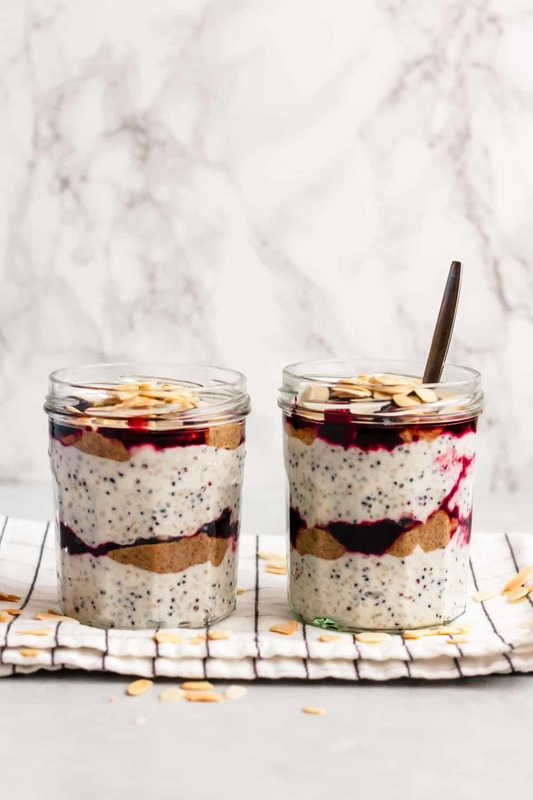 These Cherry Bakewell Quinoa Breakfast Parfaits are packed with quinoa, cherries and almond butter and are the perfect grab and go breakfast! I come bearing another insanely delicious breakfast recipe. That may sound like a bold claim, but you know when you make something and it just tastes amazing? Well, this is one of those recipes. The whole is far greater than the sum of it’s parts. And you can have it for breakfast tomorrow! And I shall be jealous, because it’s been a few days since I have had it for breakfast and I don’t currently have the ingredients to make it. (I know right – what is wrong with me?!) The next time I go grocery shopping, I will definitely be making sure I have everything on hand. Which is easy, because you really don’t need much to make these! In case you’re not sure what bakewell tart is, it’s a pastry tart made of jam (often cherry or raspberry) and frangipane, topped with flaked almonds. I don’t know about you, but for me, cherry-almond is just one of the best flavour combos! 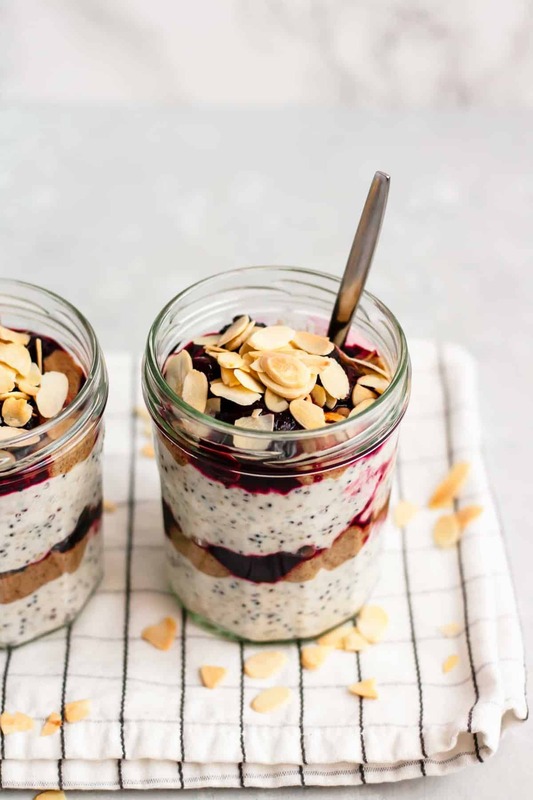 Rest assured, there’s no pastry in these Cherry Bakewell Quinoa Breakfast Parfaits, but instead they’re packed with yoghurt (any kind! ), quinoa, an easy cherry compote and almond butter. And of course topped off with toasted flaked almonds for the essential crunch factor! Gotta have that crunch. This is such a simple breakfast which is awesome for taking with you on the go. Fill up the jars the night before, pop them in your bag and then take them to work! Or ideally, sit and savour every spoonful, which you’re definitely going to want to do. 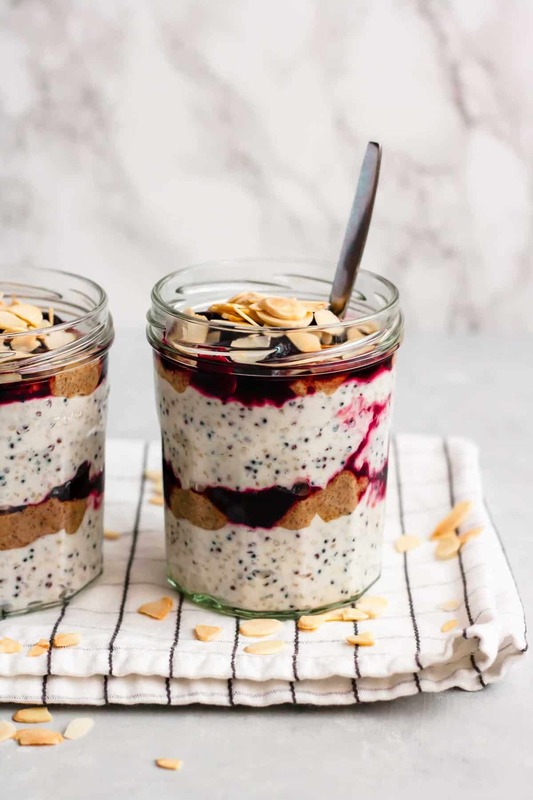 You can absolutely adapt these Cherry Bakewell Quinoa Breakfast Parfaits to whatever you have in your fridge or whatever combination you can dream up. I’m obsessed with cherries and almond butter but think of the possibilities! You could use any cooked grain, any kind of yoghurt (make it vegan if that’s your thing! ), any fruit and any type of nut butter. I can’t wait to try out some new variations! I’m thinking that some kind of tropical cashew butter version with coconut yoghurt would be incredible… Yum! Endless breakfast parfait variations are in your future! But first, make these ones, ok? The recipe as written makes 2 servings but you could obviously double it so you have a few portions ready to go at a moment’s notice. And as someone who often has to get to work super early in the morning, let me tell you, these are a definite win. There’s nothing like a ready made breakfast to take the edge off a 5am start (short of getting back into bed, of course!). In a small pan (I use a small frying pan) combine the frozen cherries, maple syrup and water. Cook over a medium heat, stirring frequently and squashing the cherries down a little, until syrupy. This should take 5-10 minutes. In a medium bowl, stir together the cooked quinoa, yoghurt, maple syrup and vanilla powder/extract. 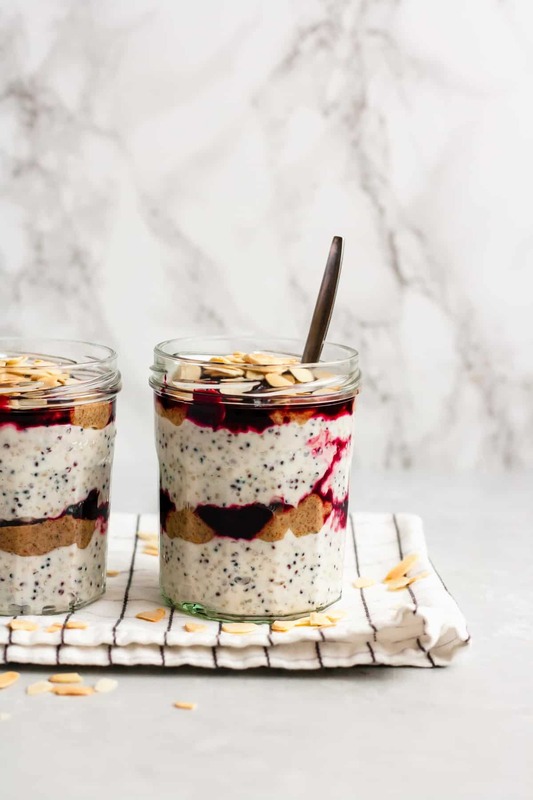 In two jars, layer up your parfaits. Start with 1/4 of the quinoa yoghurt mixture in each jar, followed by a couple of teaspoons of almond butter. Layer 1/4 of the cherries into each jar. Repeat with the remaining quinoa yoghurt mixture, almond butter and cherries. Top each jar with 1 tablespoon of toasted flaked almonds and dig in! 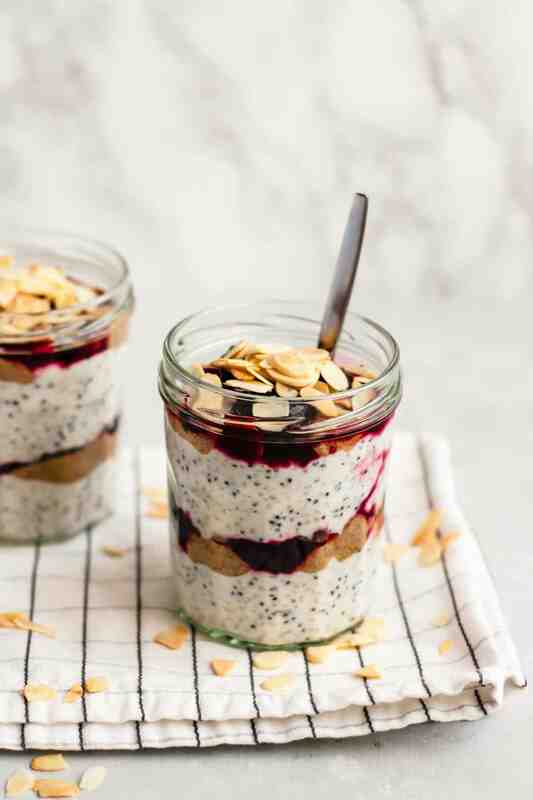 These Cherry Bakewell Quinoa Breakfast Parfaits are a great make ahead breakfast! Make them the night before and grab and go the next morning. These look so yummy! I’ve made quinoa porridge before (cooking quinoa with cardamom pods & cinnamon stick, then mixing in some whole milk & coconut sugar or honey) but never thought to make a cold breakfast with quinoa. Definitely going to give this a try! Hi Kat! I hope you love this breakfast! I feel confident that you will 🙂 your quinoa porridge idea sounds divine!! I’m going to have to try that one myself! HOLY MOLY!!!! I love coming across new ways to eat quinoa and this takes the cake! I’ll definitely be making these for when I have to get out of the door asap! Haha, so glad you like them! They’re SO good for busy mornings!